Dodger Stadium package tour includes visit to baseball's third-oldest stadium in USA plus visit to Hollywood's most iconic Walk of Fame. Highlights of Dodger Stadium tour includes trip down to the field of Dodger Stadium, visit into the Dodger Dugout, exclusive loo at the Lexus Dugout Club: VIP restaurant and lounge - home of the World Series trophies, baseball MVP awards. 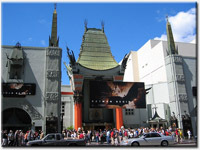 Dodgers Stadium private tour also includes a visit to Hollywood Walk of Fame and TCL Chinese Theater to see hand and foot prints of the famous stars. Dodger Stadium tour excursion is great for families with kids and baseball fans of all ages! To check for availability and price for Dodgers Stadium kid friendly tours Los Angeles, just drop us a quick note to info@latraveltours.com or call 1-800-761-1775, In Australia, call (03) 9005 5907. Custom private quotes available for a private sightseeing bus (coach rental) group tours, Dodgers field trip tours. Best rated family trip tour and excursion on TripAdvisor, Yahoo and Google - reviews for American Riviera private tours.